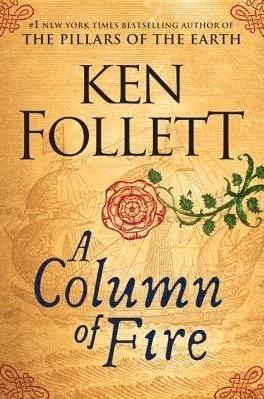 Having read both The Pillars of the Earth and World Without End, I would like to read The continuing saga of Kingsbridge in Ken Follett’s latest novel A Column of Fire. It begins in turbulent times during Christmas 1558. Elizabeth Tudor has been Crowned Queen of England. However there are many including her estranged sister the alluring, and headstrong Mary Queen of Scots who is currently in Paris with the brutally ambitious French Royal family. They have proclaimed her the rightful ruler of England, and there are many supporters in France who are scheming to get rid of Queen Elizabeth I and much of Europe turns against England. However Elizabeth is a shrewd, and determined young monarch and To counter any threat she decides to set up a secret network of resourceful spies and courageous agents led by Sir Francis Walsingham, whose job it is to keep her informed concerning any threats to the Monarchy and give an early warning of any assassination plots, rebellions and invasion plans. Walsingham rose from relative obscurity become an important figure in Elizabethan England, overseeing foreign, domestic and religious policy. He served as English ambassador to France in the early 1570s and witnessed the St. Bartholomew’s Day massacre. As principal secretary, he supported exploration, colonization, the use of England’s maritime strength and the plantation of Ireland. He worked to bring Scotland and England together and encouraged a foreign policy which bolstered the role of England as a maritime, Protestant power with intercontinental trading ties. He also oversaw operations that penetrated Spanish military preparation and gathered intelligence from across Europe. Meanwhile young Ned Willard returns home to Kingsbridge to find that Kingsbridge has also changed. The ancient stones of Kingsbridge Cathedral now look down on a city torn by religious hatred. Then Ned is given an opportunity to serve his Queen when he asked to join Elizabeth’s network of spies and agents. However this position comes at a price and Ned soon finds himself at odds with the girl he longs to marry, Margery Fitzgerald who is actually marrying someone else And the love between Ned and Margery seems doomed. Gradually extremism sparks violence from Edinburgh to Geneva as Europe is enveloped in turmoil when high principles clash bloodily with friendship, loyalty and love, and Ned finds himself involved in a battle for tolerance and compromise against tyrants intent on imposing their ideas on everyone else no matter the cost.